Since its opening in 1956, Louisville, Kentucky's Freedom Hall has been one of the nation's premier sports and entertainment venues. It has been the home of six NCAA Final Fours, the World's Championship Horse Show, Muhammad Ali's early professional fights, the Kentucky Colonels of the ABA, and an untold number of concerts, circuses, rodeos, ice shows and other family events. Mostly, though, it has been the home of the University of Louisville Cardinals basketball teams, who will move to a new downtown arena late in 2010. 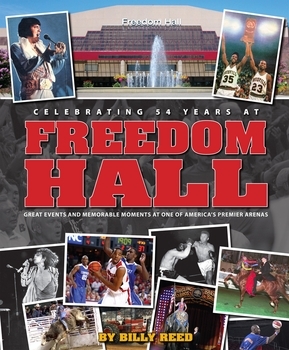 In its 54 winters in Freedom Hall, the U of L men's basketball team won NCAA titles in 1980 and '86. For more than five decades, Freedom Hall has been both a gathering place and a crossroads for millions of Americans and almost every Kentuckian. Along with Churchill Downs — home of the Kentucky Derby — Freedom Hall has made Louisville the home of two iconic sports and entertainment venues. As a tribute and loving send-off to the arena that the Rev. Billy Graham once called "the most beautiful auditorium in the world," award-winning journalist Billy Reed captures some of Freedom Hall's greatest events and most memorable moments in this nostalgic salute to one of America's premier sports and entertainment venues. As a newspaper columnist and magazine writer for more than 50 years, Billy Reed has covered innumerable events in Freedom Hall. It was there that he saw such wonders of the world as Julius Erving and Darrell Griffith dunking, Muhammad Ali punching, and Elvis Presley kissing . . . Billy's wife! In his half-century as a journalist, Reed has been a senior writer for Sports Illustrated, sports editor and general columnist for The Courier-Journal, and sports columnist for the Lexington Herald-Leader. He has won numerous regional and national writing awards and has authored, or significantly contributed to, 15 books. As a member of the Kentucky Athletic Hall of Fame (class of 2001), he is the subject of one of the plaques that hang on the concourse walls in Freedom Hall.